This is the unspoken question I face nowadays as I promote my upcoming myth series, Loss of Innocence. It is an excellent question, I must admit. There seems to be no end to the list of atrocities, scandals, political shenanigans, massacres and environmental outrages. It seems as if we either need to storm the battlements for life, liberty and justice or collectively bury our heads in the sand. At a time like this, why would anyone want to spend her time studying those old tales of endangered children, mean middle aged women and absent fathers? Why indeed? As I mentioned way back in one of my very first blogs, the old gods do not just fade away when their temples are destroyed. They remain in this realm by inhabiting or overshadowing those elements of nature that most resemble them in power, attitude and focus. So the gods of war haunt the battlefields and the gods of love leer suggestively in the red light districts. The gods of healing cycle through the hospital air system and the gods of knowledge sink into the libraries and lecture halls. The same is true for the old tales. When these old stories, like the old gods, are no longer spoken about around the glowing embers, when the dark is no longer propitiated with song and dance, and the bloodied teeth of the night terrors are no longer allowed to move freely through the words and gestures of the griot ... they take on lives of their own. And these old tales and these old gods come alive without the mediation of culture, elders and the soul of humanity. So instead of us offering the first fruits of the harvest to the agricultural deities, we instead place monsanto derivatives into their soil of their bodies. Instead of offerings for the sweet waters of our rivers, we let industrial and superfarm waste spread diseases to all that lives down river. (And face it, we all live down river.) So the stories and the gods become distorted caricatures of their real nature. So the tortured land taints our food. And the dark tales enters the blood of the willing and terror is let loose upon the land .... and upon our very children. So I seek answers within the words of our ancestors. 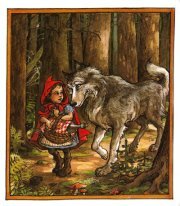 Maybe we can identify why the wolf waited for Red Riding Hood instead of devouring her as soon as he found her in the woods. Or we can learn the skills of the dwarfs and rescue the lost children. Or maybe, we can strengthen our hearts, brains, homes and courage for the work that is already in our hands. And then maybe, just maybe ... we can reconcile these beasts of our own makings.